SOLD! 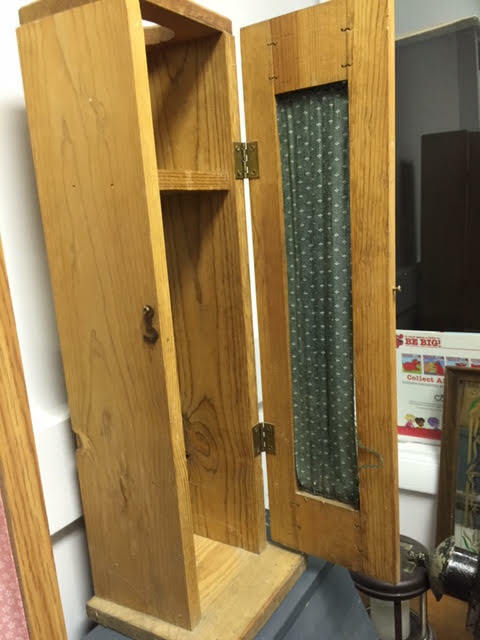 Curtained Country Boxes – Perhaps TP Cabinets? 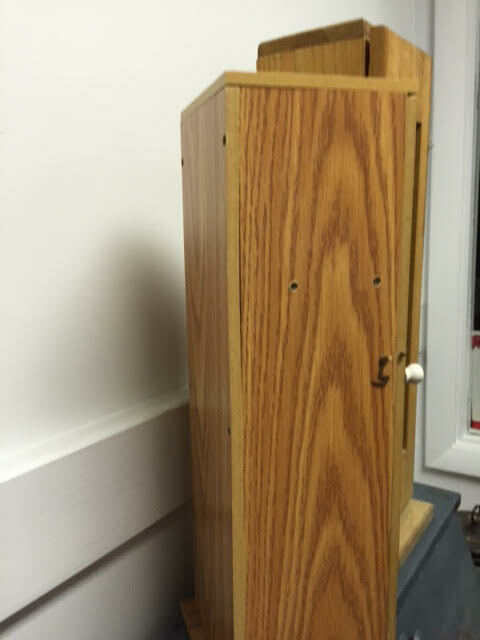 We have two primitive shelf type boxes, each with a single door that latches shut, a curtain in the “window” area of the door, and plain inside with no shelves. 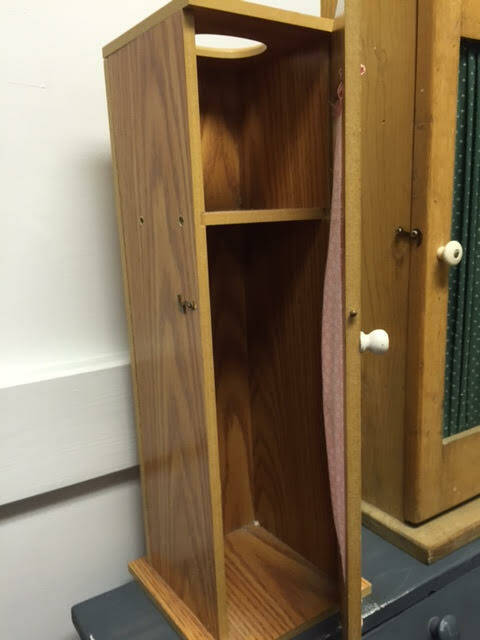 We don’t really know what they were used for… to store something tall and thin? Just for the decorative aspect? The larger, green, one has a cut-out in the back, so I suspect that someone tried to put a light fixture in there (??). A friend says they were probably used to store toilet paper… that would work. Condition: Structurally they’re in good shape. The larger one has the cut-out in the back that was done kind of messily (as the photo below shows)… it doesn’t have the good square edges as one would hope. 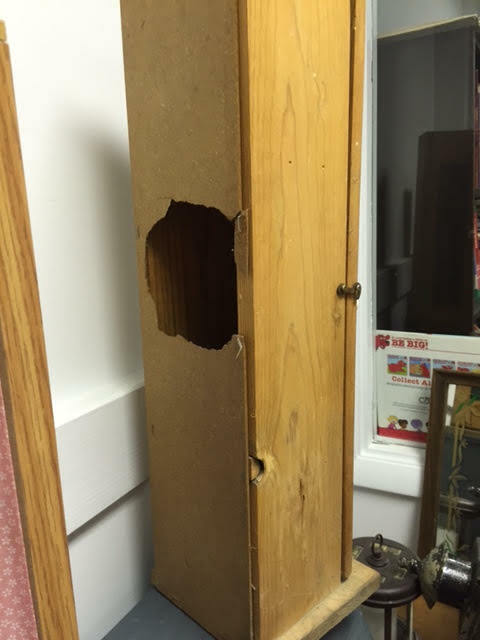 It also has some kind of damage on the back corner, which luckily doesn’t show when up against a wall. The pictures at the end of this blog give a better sense of what they look like from front and back, as well as the insides. Dimensions: The shorter, pink-curtained, one is 21″H x 5 3/4″W x 6 1/4″D. The larger, green-curtained, one is 25 1/4″H x 6 1/2″W x 6 1/4″D. Price: $6.00 each or $9.50 for both. Maine State Sales Tax of 5.5% applies. 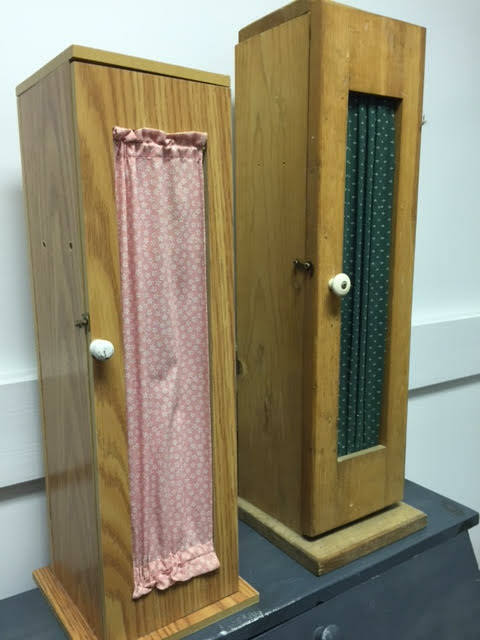 This entry was posted in Country Decor, Home Decor, Project Pieces, Repurposing, Craft & Upcycling Ideas and tagged Country Decor, curtained box, curtained shelf, primitive, repurpose. Bookmark the permalink.